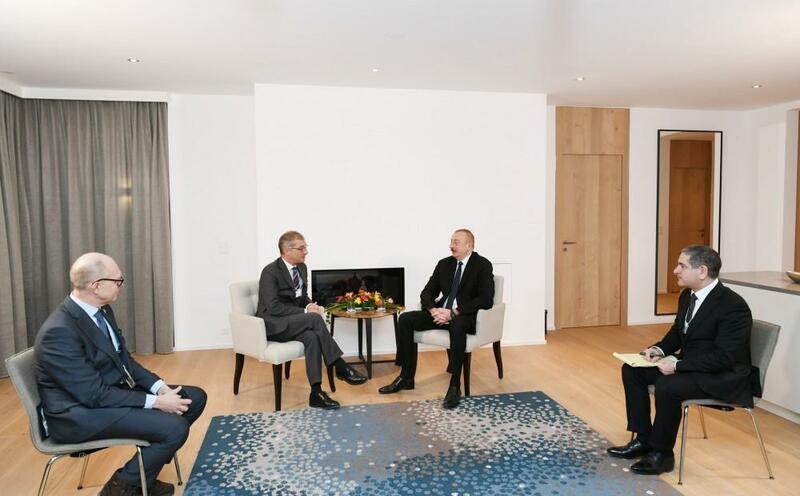 President of the Republic of Azerbaijan Ilham Aliyev has met with President of Europe Selling & Market Operations at Procter & Gamble Loic Tassel in Davos. Tassel hailed the positive results of economic reforms carried out in Azerbaijan in recent years. He noted that the business environment and conditions created for investors in Azerbaijan encourage Procter & Gamble to expand its activities like other companies in the country. Pointing to the activities of Procter & Gamble in Azerbaijan, Loic Tassel noted that the company is not only engaged in the sale of consumer goods, but also significantly contributes to the development of the advertising market in the country. “The company, which is the largest advertiser in Azerbaijan’s TV space, also carries out its social responsibility mission by sponsoring various social projects, sporting competitions and other support measures,” he said. Tassel noted that Procter & Gamble is keen to expand its activity in the region by taking use of emerging business environment. President Ilham Aliyev highlighted the business environment created in Azerbaijan, as well as the reforms carried out in customs, tax and other areas. The head of state described the company’s decisions on expanding its activities in Azerbaijan as right ones. President Ilham Aliyev noted that the government of Azerbaijan will continue supporting investors and entrepreneurs.